Shirt sponsorship was first permitted by the Football League in 1977, and was still an infant concept in the early 80s, as clubs and companies began to explore ways to increase exposure. Jimmy Hill, a trend-setter throughout his career, was chairman of Coventry City at the time and negotiated a deal with car-maker Talbot, who produced cars in the city. Their logo was first seen on the famous Admiral ‘tramlines’ kit, but Hill was already planning the next outfit, which was released in 1981. While a mooted plan to rename the club Coventry Talbot didn’t come to fruition, a bold proposal to fully integrate the company’s logo into the kit did come to pass. 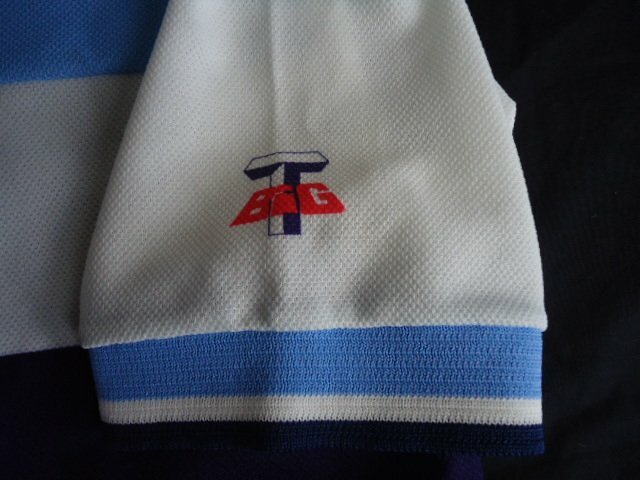 Officially produced by Talbot Sports – the logo was literally a ‘big T’ – the home and away strips were in the same design and left no doubt as to who the sponsors were. However, there was a problem – sponsors’ logos were not allowed to be displayed in games which were televised. For most clubs, it was simply a case of playing in plain shirts, but the BBC weren’t falling for Coventry’s assertions that the navy and white panels were just designs. Completely different shirts were required. As kits went, they weren’t bad – the side panels, though slightly large, were ahead of their time – but inexplicably the backs of both the blue and red shirts were white. Given that a lot of teams with blue home shirts had white aways, this was also problematic. As a result, when Coventry hosted Ipswich Town in January 1982, a blue variant of the ‘TV kit’ was used, this one with a sky-blue back. However, this kit was not always worn when required – in 1982-83, Coventry hosted a white-clad Manchester City, causing confusion (note from the pre-match warm-up that the Coventry players had ‘Talbot’ tops). A ‘proper’ third kit was also worn. First seen against Aston Villa in February 1983 as the blue and red shirts were deemed to clash, the all-yellow outfit had the large Talbot logo but with plain shorts. It was also worn in the game against Everton at the tail-end of the season. Two seasons, six shirts – and nary a club crest to be seen. While sponsors were permitted for televised games from 1983 onwards, the rules on logos in general were tightened, to ensure that nobody else would attempt anything as ambitious as Coventry. For the Sky Blues, a move to Umbro was in store in the summer of ’83 while the Talbot association would end too. The next kit, a two-tone-blue striped offering, carried the names of three sponsors during its three-year lifespan – Tallon, Glazepta and Elliotts.